microSD card (512MB - 2GB), microSDHC card (2GB - 16GB) *SDXC card cannot be used. * In this product installed are MP3 decoder "ISC-MP3 BF523 d Korg" developed by Institute of Super Compression Technologies, Inc. (ISCT), Japan. "*" denotes the product code extension indicating country or area. * Manufacturers are subject to change details of operation for microSD/SDHC cards sold under any given product code. This guide does not guarantee every possible operation with regards to using microSD/SDHC cards. * Under intense memory access (during, for example, simultaneous use of mp3 playback and MASTER RECORDER), users may experience display and or audio glitches. * microSD/SDHC cards are subject to reduced access speed during extended use of large file numbers. This may lead to display and/or audio glitches. 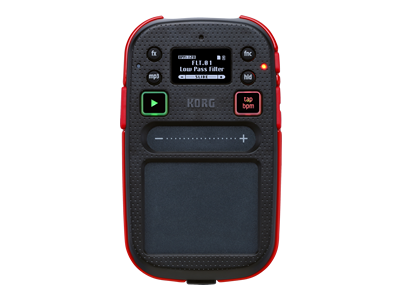 * Problems may arise from microSD/SDHC cards that have not been formatted with the mini KAOSS PAD 2. Always format with mini KAOSS PAD 2 for proper operation. * Using a higher speed class microSDHC card will not result in faster memory access when using mini KAOSS PAD 2.